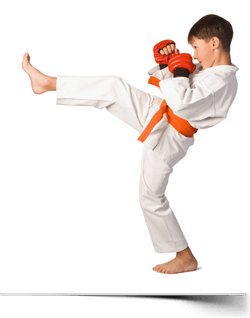 There are a number of different martial arts styles which makes it confusing to newcomers wanting to take up the sport. Your choice needs to be based upon what you want to achieve from your chosen style: do you want to learn self defence? Compete? Increase your fitness or strength? That is why Marsden Martial Arts allows you to try various styles before settling on one to achieve your goals – a new and different approach for Chesterfield Martial Arts. We have also given some information below on what to expect from each style, in advance and our free trial will give you a taste of what is to come. All Martial Arts Styles fall into two categories – armed and unarmed. Unarmed Martial Arts comprises of striking styles (kicking and punching); Wrestling styles (wrestling, grappling, throwing) and finally a combination of both wrestling and striking. Armed Martial Arts include archery, fencing (both western and eastern) firearms and kobudo – the study of ancient weapons. Unarmed martial arts is definitely the most popular of the two categories, especially for those taking up the sport. Here at Marsden Martial Arts we concentrate on unarmed martial arts – teaching best practice to get the best results for you! All challenge participants physically and mentally. In recent years Kick Boxing in Chesterfield, just as with the rest of the U.K. Europe and the U.S, has become popular and has overtaken many of the more traditional styles. Chesterfield Martial Arts at Marsden Martial Arts teaches mixed styles and suits all ages and abilities. Wrestling (or grappling styles) is also a worldwide form of unarmed combat, this includes: Greco-Roman; Freestyle; Catch wrestling; along with Judo; Brazilian Jiu Jitsu; Aikido; Japanese Sumo; Sambo from Russia; Indian and Turkish Wrestling, plus Lutte from around France and Italy. The world has an abundance of these combined martial arts styles including Ju Jitsu from Japan, Hapkido from Korea, Aiki Jutsu and Atemi Jutsu from Japan also and Vale Tudo from Brazil. Here at Marsden Martial arts we teach mixed martial arts from these countries, you just need to choose a style based upon your own personal goals. Whether you want self defense, fitness, strength, confidence or self discipline we have a style that will suit you – you just need to give it all a go, so take the plunge and come and enjoy the fun! Let us help you select a martial arts style that best suits you!